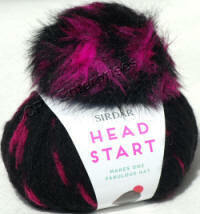 Sirdar Head Start yarn is a fantastic hat in a ball package which includes a really trendy pompom in a fabulously bright colour to sew on. There are 2 shades with bright colour flecks with 12% Mohair and a pompom to match plus 2 colours with mixed colour pompom. 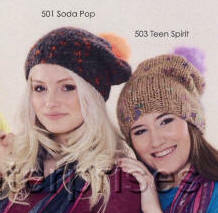 There is a pattern on the Head Start ball band to make an easy-to-knit hat using 10mm and 8mm needles. You can also download a free PDF pattern for a Pompom Scarf which uses 2 balls.